One of the problems with modern military simulations is that even if you could be accurate without compromising military secrets, it would be excruciatingly boring. Real soldiers and pilots and sailors spend years preparing for a few minutes of battle. Those few minutes won't really be much fun (or survivable) without the years of preparation. So we have conflicting goals: to realistically simulate something that isn't really fun in a fun and exciting way. I don't think that Under the Ice has found the balance. Under the Ice is a single-player game that puts you in the role of a task force commander (either NATO or Soviet) with two or more submarines under your direct command. 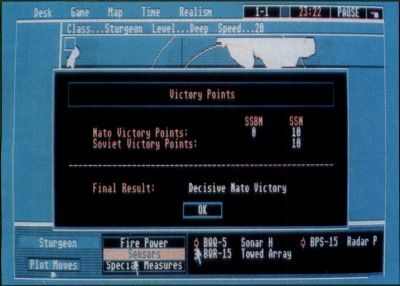 You pick the scenario and the side you fight on, the computer picks your ships and your weapons so that each game is a little different. Your mission is to use your ships to find and sink the enemy before he does the same to you. There are a variety of ship classes and weapons. Permit, Sturgeon, Los Angeles and Trafalgar class ships on the NATO side and Victor 1, Victor 3, Yankee and Delta class ships on the Soviet side. Different ships carry different combinations of torpedoes and missiles. You track the progress of your units on a map of their patrol area with sensor information provided either as lines pointing from the detecting platform toward the contact or, if the information is good enough, as icons representing the location of the enemy ship. To give orders to one of your ships, you click on it and use the control buttons to control weapons, sensors or movement. To get information about a target, you click the mouse on the target on the screen. A line at the top of the map tells you the class of ship, its depth and its speed. After you select a target, you can order one of your ships to shoot it. The game disk itself is unprotected. For copy protection, it uses a password system where the game asks you to type in a word from a random place in the manual. This method is certainly a lot less painful than disk encryption, since it leaves you able to make your own backups. The play of the game is fair. Selections under the GEM menu bar allow pausing the game and changing the time progression. There is no game save, and there doesn't seem to be any way to restart the game without actually quitting the program and running it again. There's also a game realism switch that determines whether you see torpedoes fired at you plotted on the map or only from the direction they are coming. The use of the mouse to select units to command and targets to shoot is a good idea, but can be a pain. If you try to select one of the ship icons on the map but miss by a little, you execute a map zoom. If you're used to animation that moves smoothly, or even semi-smoothly, the complete redraw of the screen every two seconds will annoy you. Having to wait for the program to accept commands may also drive you nuts. But to be fair, this simulation doesn't really have to have the instant response of an arcade game. While controlling the movement of the ships by entering route legs is convenient, there doesn't seem to be a way to change the current depth or speed without deleting all the route legs back to your present position and entering new ones. Very clumsy. 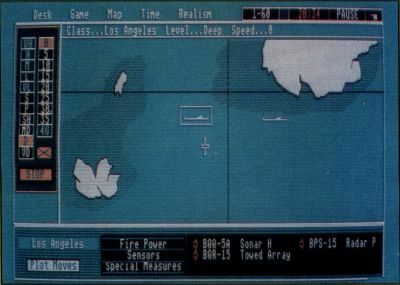 The time the ship reaches the end of each route leg is listed on the screen to allow coordinating task force movement, but since the time isn't shown until the leg is defined, it's not very useful. There are problems in the information line that give depth and speed at the top of the map. If you change depth or speed, it doesn't update until you select another ship and then go back to the first. The simulation is less than fair. The capabilities of the different classes of submarines are not fairly represented by the speeds and depths at which they are allowed to operate. I can only hope that their noise levels and sonar capabilities are modeled in the program to provide a realistic advantage of one ship over another. The arena of action, a small section of the North Sea, is too limited. Finally, the manual attempts to give some background and hints on tactics, but doesn't go far enough. It concentrates on how sound propagates in the water without telling you how to use that information. This game has many of the strategic aspects of a war game and less of the shoot-'em-up action of the video game. If you like a game that is more tactics than reflexes, you may enjoy this one. If you're looking for an accurate submarine simulation, however, save your money. The bottom line: Get a demonstration first. Robert Goff is a part-time freelance author specializing in the Atari ST. To pay the bills, he is a naval officer with ten years of experience in submarines.